Climate change was a popular topic at ANZ’s annual general meeting (AGM) today in Sydney. 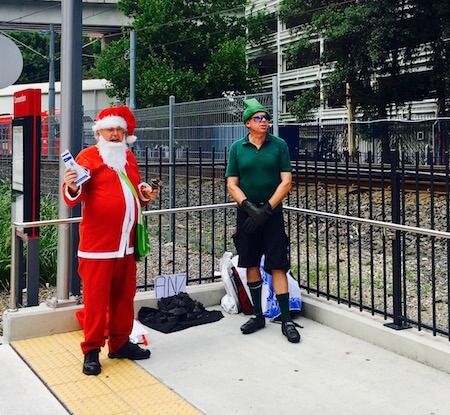 Even before the meeting started, shareholders were greeted by Santa and some elves, who were handing out fliers highlighting ANZ’s fossil fuel lending. Inside the meeting Chairman David Gonski addressed the issue in his opening speech, reiterating last year’s comments that ANZ’s lending to coal is trending down and will continue that trend into the future. As has been the case at previous AGMs, climate and fossil fuels dominated question time, with shareholders concerned about the hypocrisy of ANZ’s lending after committing to helping humanity limit global warming to below two degrees. Several examples of inconsistency between ANZ’s climate commitments and continued lending to fossil fuels were pointed out to the Board. Is climate risk a material business risk? Under questioning from a shareholder ANZ’s auditor, KPMG, confirmed that it classifies climate risk as a material business risk, particularly in relation to credit risk, which is the ability of borrowers to repay loans. The shareholder then asked why the bank loaned to companies like Cooper Energy, Boral Limited and Beach Energy, which are exposed to climate risk but don’t classify climate as a material business risk. Chairman Gonski assured shareholders that ANZ won’t lend to companies unless the bank is satisfied with those companies’ approach to climate risk (see the video below). However, if ANZ were taking this seriously, the bank would limit its exposure to companies like Cooper Energy, which recently received $250 million from ANZ to help open up gas fields in south-east Australia. Further highlighting ANZ’s hypocrisy on climate change, shareholder questioning drew attention to ANZ’s lending to Oil Search (a company that is planning to develop an oil field in Alaska), coal fired power stations in Indonesia and Hong Kong, and India’s Rural Electrification Corporation. Rural Electrification Corporation is a company whose main business activity is disbursing loans to power projects, most of which are coal-fired and breach ANZ’s stated carbon emissions limit. The ANZ board refused to comment on specific projects, leaving the inconsistencies between the bank’s climate commitments and fossil fuel lending unaddressed. While it is heartening to hear that ANZ is restricting its exposure to coal, it’s clear from today’s shareholder questioning and ANZ’s inadequate responses that ANZ still has a way to go towards meeting its own commitments. Do you bank with ANZ? Use the form below to put the bank on notice!